IBM® Information Management System (IMS™) provides leadership in performance, reliability, and security to help you implement the most strategic and critical enterprise applications. IMS, IMS utilities, and IMS tools continue to evolve to provide value and meet the needs of enterprise customers. With IMS 12, integration and open access improvements provide flexibility and support business growth requirements. Scalability improvements have been made to the well-known performance, efficiency, availability, and resilience of IMS by using 64-bit storage. 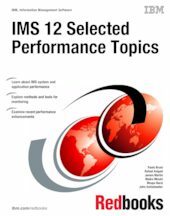 In this IBM Redbooks® publication we provide IMS performance monitoring and tuning information by describing the key IMS performance functions and by showing how to monitor and tune them with traditional and new strategic applications. This book is for database administrators and system programmers. We summarize methods and tools for monitoring and tuning IMS systems, describe IMS system-wide performance, database, and transaction considerations. Based on lab measurements, we provide information about recent performance enhancements that are available with IMS 12, and advice about setting performance-related parameters.